I haven't felt very inspired lately since I've had a lot going on in my personal life, but that all changed when I discovered the Lookbook of Rifle Paper Co.
Rifle Paper Co is known for their unique hand-painted style stationary. This lookbook, In Bloom, is filled with pictures recreating some of their actual products using real flowers. It really brings their products to life, and makes me want to purchase a print even more. 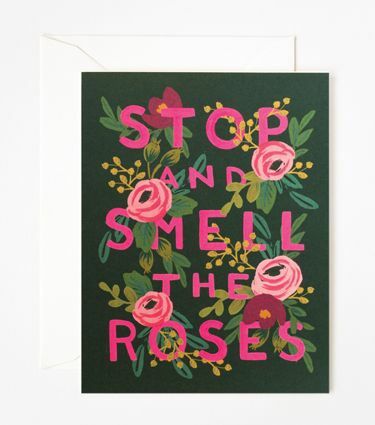 This stop and smell the roses art really inspired me to stop and think about what inspires me as a designer and how i really need to get back to creating. This includes blogging on the reg. Which was one of my New Years Resolutions, look how that worked out. However, with my boyfriend moving back in August, I know I will need to keep myself busy. So what better way than to blog? I hope to actually follow through with some projects that I have wanted to accomplish for a few years. I have been a huge fan of Rifle Paper Co for a few years now, and I'm excited to be going to New York for a business trip and attending the National Stationary Show, where they will be exhibiting. SWOON! I'm so excited to see what they have and hopefully purchase something for myself. If you are looking for a daily dose of inspiration please follow Co-founder Anna Bond on Instagram. You get sneak peaks at upcoming products and side projects that she's working on, such as the In Bloom Book series for Puffin Books. She has currently designed Heidi, Little Women, The Little Princess and Anne of Green Gables. And because I follow her on Instagram I found out she just wrapped up Alice in Wonderland (another of my favs!) Someone please buy all 5 of these books for me? They are gorgeous!!! So, everyone needs to venture over to Rifle Paper Co's website and take a look. There is something for any of those great gal's in your life or perhaps your mom? Mothers day is coming up here really soon! I already have my eye on something for my mom :) But for now, when life gets a little too crazy, just remember to stop and smell the roses!